If I didn’t know for sure, I’d have said that the English cousins were fading. In the wan light of the massively scaffolded hulk of Victoria Station, being retrofitted high above the comings and goings of the kingdom’s masses, I thought I saw them – just for a second – struggle to keep their young eyes open. Like a fast-moving movie or a game of Scotland Yard, we kept popping up all over Central London that day: brushing past the British Museum on our way up to Oxford Street. Ducking in to the little park in Soho before taking in Liberty’s, one of London’s coolest department stores. Cruising Carnaby Street for a lunch spot (Leon for wraps). 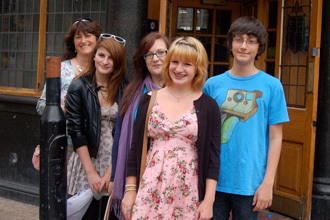 We even took a short jaunt by tube to pop up at Piccadilly Circus, because one of the Leicester cousins had never been. Mid-afternoon, we ogled designer dog costumes in Harrod’s and salivated over the towering displays in the Food Halls that I love so much. By the time we landed back on the London streets, the evening commute was in full swing and we fell to earth in Hyde Park for a spot of tea in the grass beside Rotten Row. Oh, blessed relief. I was pleasantly surprised to find that Wilton Street, a stone’s throw away from Victoria Station, had come up in the world. We went there seeking a good curry and ended instead in the local Nando’s. Nando’s is one of those places that makes you feel good about the world. An attentive staff guides you through the menu: what to choose, how to order. It’s all bright and casual and friendly. Amidst a colorful tableau of wall ornaments we kicked back around a big table and relaxed. By the time great platters of food arrived, the cousins had revived. Now while Nando’s has enough side dishes and salads to please the vegetarians among us, the main event here is peri peri chicken. Marinated overnight and then grilled to perfection with your choice of heat, it comes with its own little bottle of hot sauce for the adventurous. This chicken is tender and delicious, and guaranteed to put a smile on the face of even the weariest of travelers. Or the hungriest. Peri-peri note: This dish is named for a chili sauce that is made in the South African country of Mozambique and, by connection, in Portugal. It is synonymous with piri-piri, the name for a small and extremely hot chili pepper that grows in hot climates. Tom Stobart in ‘The Cook’s Encyclopedia’ mentions three ways that the sauce is made – by cooking lemon, fresh chilies and oil together, by fermenting them in the sun, or by creating the sauce from powder. Past that, he says, the recipe is open to interpretation. 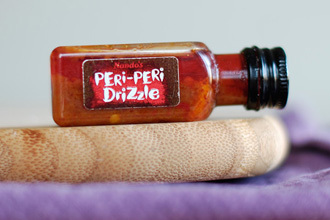 Peri Peri Drizzle from Nando's in London. Marinate the chicken: Put the chicken halves in a large ceramic or stainless steel bowl. Pour on the vinegar and sprinkle with cayenne pepper, salt, garlic, paprika, and New Mexico chili powder. Tuck lemons into the chicken, pour on the oil and top with 1 teaspoon of the American chili powder. Cover with plastic wrap and let marinate overnight or up to 24 hours in the refrigerator. Turn the chicken at least once during this time. 1st bake: Put the chicken halves skinside up in a lasagna pan, cover with the marinade and squeeze the lemons over them. Tuck the lemon pieces into the open areas of the pan and bake in a 350° oven for 1 hour, basting with the juices every 20 minutes. Finish the chicken: You have a choice on how to finish this chicken, just as you would at Nando’s (okay, their choices are a bit different, but you get the picture). Baked. Raise oven temperature to 425°. Remove all but 1 cup of the marinade from the pan, sprinkle the chicken with a teaspoon of chili powder and nestle in the dried chiles if desired for a little more heat. Bake for 25 minutes, until the skin is medium brown. 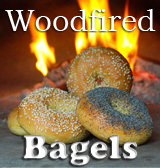 Woodfired. Your fire should be at least 1½ hours old. Push coals to the back and sweep the ash. Remove all but 1 cup of the marinade from the pan, sprinkle the chicken with a teaspoon of chili powder and nestle in the dried chiles if desired for a little more heat. Bake for 20 to 30 minutes, until the skin is medium brown. Turn pan around halfway. Barbecued. 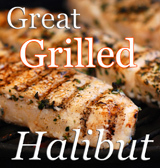 Finish for 10 or 15 minutes over mature coals or on a gas grill set at medium heat. Final note: There are several recipes for peri peri or piri piri sauce available out there that would spice up this dish even more. By all means try them. But I find that this chicken is as moist and flavorful as they come, and stands very well on its own. Enjoy! What an inviting dish…beautiful as well as delicious, I imagine…thanks for sharing. Nando’s Peri-Peri chicken was our favorite when we visited my brother in South Africa! So happy to have a recipe for it! We loved London too, so much to do, in so little time. Wow – some of your recipes are way too complex for me, but this chicken – I will have to make it! My family will love it. Amazing! Love the write-up Don! We took the kids into London a few days ago to enjoy the Winter Wonderland in Hyde Park before it was dismantled, and I felt a bit nostalgic for my years as a Londoner. But, living just an hour out means we can enjoy what the city has to offer and then get back out to the country and relax. As for peri-peri, I’d be tempted by your recipe if it wasn’t so easy for me to just pop into my nearest Nando’s! Oh and Liberty’s – what a beautiful store. Ooooo-che-wa-wa! Sounds hot and spicy! Sounds wonderful! Did you have rice and beans on the side … what to cool the palate? I’m trying not to admit it, but I was so worn out that evening (and somewhat jetlagged) that I don’t remember what my sides were. Every dish came with a choice of two, and I think one of mine was salad. But I do remember the chicken! Surprisingly, this chicken is not as hot as it sounds. You can certainly bump up the heat if you like, but if you remove some of the skin when it’s on your plate, the meat inside is flavorful without being spicy. Do give it a try! There is nothing more lovely than London. Well, perhaps this recipe! Fabulous chicken with amazing color. I love the chilies. I had Christmas with a Portuguese family and they made their turkey in just this way Don. Now *this* looks amazing. Your photo makes me want to recreate this in my own home! 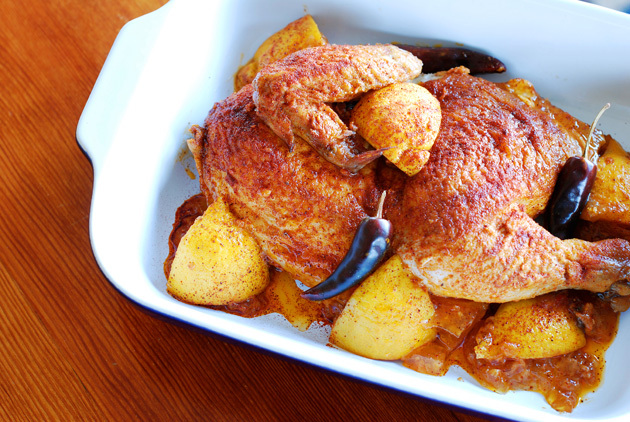 This Peri Peri idea sounds great to me – I will give it a try for my mom’s birthday… Thanks for sharing!! Nando’s provided me with a list of ingredients for their chicken, and while lemon juice was one of them, the zest was not. I find that the lemons contribute nicely to the marinade (without being squeezed) for a subtle bit of flavor, but I don’t add the juice until right before the cooking. This way, the lemons don’t dominate. I had Peri Peri chicken at Nando’s for the first time in London a few years ago and I was hooked!! Love this recipe! Nandos is amazing! I didn’t realize they had such a global reach. We frequent one here in Ontario, Canada and it’s excellent. I also keep a bottle of their Peri-Peri Garlic sauce at home. It looks like you and I speak the same language. The more spice, the better! I’ve been hearing about this peri peri for awhile now but haven’t been too certain about what it is. Great post! 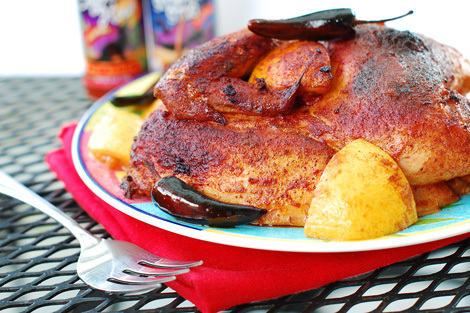 Wow, the chicken sounds amazing flavorful with the chili powders you use! Excellent! Chicken! Ever since making Julia Child’s rendition of roasted chicken, I’ve been hooked on the stuff. It’s nice to get different takes on roasting a chicken, especially with such intriguing spices like you have going on here. Looks lovely, too. Ah, would it be too inappropriate to make peri peri tofu? This is something I’ve wanted to make for the longest time. Looks delicious! I have to try making this–or I have to get myself to Nando’s. I lived in London from ’98-’01. We used to go to Nando’s all the time. They finally got one in D.C. in the States a couple of years ago. It takes us a few hours to get there though. We fell in love with the Peri Peri chicken while in London and it was nice to get it again in the States. I’m definitely going to try making it myself now. Thanks! That looks fantastic, I sure would like a bowl of it right now. Wow, thanks for sharing…it must be incredible!!! Noticed that you said to marinate the chicken “in a large ceramic or stainless steel bowl”. Given that your marinade has vinegar, that’s not really a good idea because it can chemically react with the ceramic glaze or the stainless steel. It’s better to use a glass bowl.